Do you have difficulty in finding new fish dishes to make? Many folks simply think that the term “meat” applies to chicken, beef, and pork, but it can also include fish as well. While tuna fish may be the first fish you think of because it’s incredibly easy to make, salmon should be given more credit on that front, since (as you’ll be surprised to see when you make it) this easy-to-whip-up dish only takes 35 minutes to make in total (including prep time). That’s even less time than it takes to make a chicken recipe! What’s so nice about this recipe is that not only does it take such a short amount of time to make, but there is also virtually no clean-up. You make everything right in the foil packet and when you’ve finished eating, you simply throw the packet away. So not only are you eating healthier, but you are also rewarded by not having to wash any dishes afterwards! 2. Snap off the ends of the asparagus spears (they will break where tender) and divide into four equal portions. 3. Spray the center of each foil sheet with nonstick cooking spray. 4. 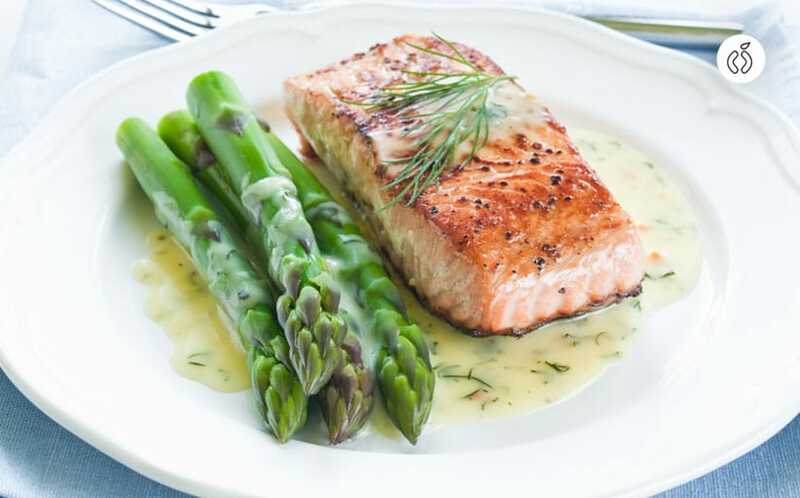 Place one salmon fillet in the center of each sheet, top with a serving of the asparagus and drizzle with lemon juice. 5. Sprinkle with fresh ground pepper and salt or seasoning blend as desired. 6. Bring up the sides of foil and fold the top over twice. 7. Seal ends, leaving room for air to circulate inside the packet. 8. Place packets on a cookie sheet and cook in the oven for 15 to 18 minutes, or until salmon are opaque. 9. Serve with lemon wedges on the side. Be careful when opening the foil packs, as the steam is very hot.